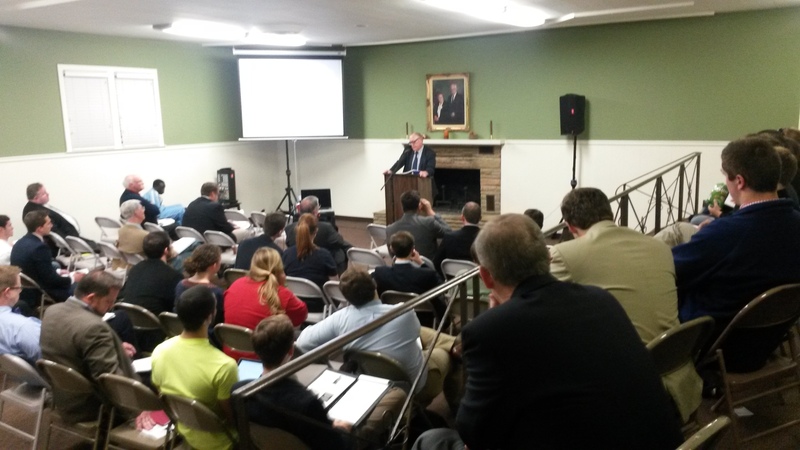 Last Tuesday the Commission for Theological Integrity shared some initial reports from our successful 2014 Symposium. Presentations were well-received, the evangelistic zeal of attendees was encouraged, and a lively panel discussion were part of this year’s program. This week we follow with two exciting announcements. You can listen to the panel discussion here . First, we are pleased to now make the 2014 collection of presentations available in digital format, available for download at the discounted rate of $10. For those wanting a sample of what they missed by not attending this year’s event, readers may download and listen to the panel discussion featuring Mark Coppenger, Clint Morgan, Rodney Holloman, and Barry Raper. Second, the Commission is also excited about their 2015 events, which will include their annual Theological Trends seminar at the National Convention in Grand Rapids. The title of the seminar will be “Discipleship in Biblical, Theological, and Pastoral Perspective.” More information will be provided soon concerning this important event, including the guest speakers. Our other event that we want to inform readers about is our 2015 Symposium, which will be held on the campus of Hillsdale FWB College in Moore, Oklahoma. The 2015 theme will be “The Theology of Discipleship.” As readers can see, the theme connects both of our main events next year, and we hope that in turn they will complement each another. Just as evangelism is critical to the church’s ministry, so is discipleship. Because discipleship is charged with theological significance, we felt that this should be given the same level of attention that evangelism is. We invite your questions and paper submissions for next year’s event. Papers can begin being submitted as of March 1 to fwbtheology@gmail.com. We look forward to hearing from you. These presentations were followed by a panel discussion on the conference theme, featuring panelists Dr. Mark Coppenger of Southern Seminary, International Missions Director Clint Morgan, Commission member and pastor Rodney Holloman, and Dr. Barry Raper of Welch College and pastor of Bethel Free Will Baptist Church. The panel discussion was moderated by Jackson Watts of the Theological Commission. The audience listened intently to Dr. Coppenger’s enthusiastic presentation. Further Symposium content will be made available in the coming days, including conference papers. Presently the bound edition can be purchased by mail for the price of $25. All purchase requests can be made by emailing fwbtheology@gmail.com, or by making checks out to “Commission for Theological Integrity,” and mailing them to the attention of Matt Pinson at 3606 West End Avenue, Nashville, TN, 37205. Next year’s Symposium will be held on the campus of Hillsdale Free Will Baptist College in Moore, Oklahoma, on October 26-27. The Symposium theme will be announced soon.